In Belgium, the Brussels-Capital Region constitutes the main gateway for international migration. Like everywhere in Europe, the challenge of immigration and in particular what happens afterwards, namely the integration of new immigrants in the host society, is particularly palpable in Brussels. Within the Belgian federal state, the federated entities have implemented different integration policies. Recently, these policies have experienced major upheavals, especially in Brussels where the result raises questions. Different (and possibly competing) institutions are competent, and today there are two civic integration programmes in the same territory: one from the Dutch-speaking community and the other from the French-speaking community. The aim of this article is to examine these policies by placing them in the particularly complex institutional context of Brussels. This involves studying and understanding the institutional labyrinth in which these policies exist, as well as describing them in order to compare them. This institutional puzzle has consequences for the stakeholders, i.e. the authorities and the migrants themselves. En Belgique, la Région de Bruxelles-Capitale constitue la principale porte d’entrée de la migration internationale. Comme partout en Europe, l’enjeu de l’immigration et en particulier de son « après », à savoir l’insertion des nouveaux arrivants dans la société d’accueil, y est particulièrement sensible. Au sein de l’Etat fédéral belge, les entités fédérées ont mis en place des politiques d’intégration différentes. Récemment, celles-ci ont connu des bouleversements majeurs, en particulier à Bruxelles où le résultat est interpellant. En effet, des institutions différentes (potentiellement concurrentes) y sont compétentes et il existe, aujourd’hui, sur un même territoire, deux parcours d’intégration civique : un néerlandophone et un francophone. L’ambition de cet article est de détailler ces politiques, en les inscrivant dans le contexte institutionnel bruxellois, particulièrement complexe. Il s’agit non seulement d’étudier et de comprendre le dédale institutionnel dans lequel ces politiques s’inscrivent mais aussi de les décrire afin de les comparer. Ce puzzle institutionnel n’est pas sans conséquences pour les acteurs: que ce soit les autorités ou les migrants eux-mêmes. In België is het Brussels Hoofdstedelijk Gewest de belangrijkste toegangspoort voor internationale migranten. Zoals overal in Europa zijn migratie en vooral postmigratie, namelijk de integratie van de nieuwkomers in de gastsamenleving, zeer delicate kwesties. Binnen de Belgische federale Staat hebben de deelgebieden een verschillend integratiebeleid opgezet, dat onlangs ingrijpend gewijzigd werd, vooral in Brussel, waar de situatie interpellerend is. Er zijn immers verschillende instellingen (die met elkaar kunnen concurreren) bevoegd voor het integratiebeleid. Vandaag bestaan er op hetzelfde grondgebied twee inburgeringstrajecten: een Nederlandstalig en een Franstalig. Het artikel strekt ertoe die trajecten in detail te beschrijven binnen de uitermate complexe Brusselse institutionele context. Het is niet enkel de bedoeling om het institutionele labyrint waarin het inburgeringsbeleid wordt gevoerd, te bestuderen en te begrijpen, maar ook om de trajecten te vergelijken. Die institutionele puzzel heeft gevolgen voor de actoren, zowel voor de overheden als voor de migranten zelf. 1In Belgium, Brussels-Capital is the Region where the greatest number of foreigners live, proportionately to the population. In 2015, 33% of the inhabitants of Brussels were of foreign nationality, compared to 9.8% of Walloons and 7.8% of Flemish people.1 Furthermore, the Region constitutes the main gateway for international migration, as approximately 11% of its active population are recent immigrants, i.e. of foreign nationality and who have lived in Belgium for less than five years [IBSA, 2014]. According to the CBAI-UCL study [Ansay et al., 2012], there were 120 000 newcomers in the Region on 1 January 2013, which corresponds to people of foreign nationality who had been living there legally for less than three years and who had a residence permit for more than three months. This goes to show how significant and sensitive the challenge of immigration is in the Brussels Region, in particular what happens afterwards, namely the integration of new immigrants in the host society. 2Beyond the figures, the integration of new immigrants has been a particularly red-hot subject for many years. In Europe, a form of integration policy has become widespread, leading to a certain convergence: civic integration programmes [Jacobs & Rea, 2007; Mouritsen, 2008; Joppke, 2007, Carrera et al., 2009]. Although they have different forms, they share common characteristics: they are intended for migrants and offer them (or require them to take) language, citizenship and shared values courses or professional training. These programmes are no longer only considered in the framework of obtaining the nationality [Huddelston & Vink, 2015], but may also be connected to the granting or withdrawal of a residence permit, economic and social rights, etc. These civic integration policies have aroused the keen interest of academic researchers, with the literature aimed at an objectification and comparative study of these programmes [Goodman, 2010, 2012, 2014; Michalowski & Van Oers, 2012; Goodman & Wright, 2015], as well as an examination from a more normative point of view [Bauböck & Joppke, 2010; Joppke, 2010; Kostakopoulou, 2010; Triadafilopoulos, 2011]. 3Belgium has not escaped this convergence, as the different federated entities in the country in charge of integration have also implemented their civic integration policies. Ilke Adam, in her work entitled Les entités fédérées belges et l’intégration des immigrés [2013a], recounted their origins as well as the motivations. Recently, these policies have experienced major upheavals, in particular in Brussels, where the situation is unheard of to our knowledge. In the territory of the Capital Region, different – and possibly competing – federated entities and institutions [Delgrange & El Berhoumi, 2015] are competent in the area of integration. The result raises questions, as today there are two civic integration programmes in the same territory: one from the Dutch-speaking community and the other from the French-speaking community. 4The goal of my analysis is to examine these two civic integration policies in the scope of the Brussels institutional design, which is particularly complex and multi-levelled. This involves studying and understanding the institutional maze which these policies are part of (section 1), as well as describing them in order to compare them in a systematic manner (section 2). Finally, I shall show that this institutional puzzle has consequences for the stakeholders: both the authorities and the migrants themselves (section 3). 6Although it would also be pertinent to examine the practices of the stakeholders responsible for implementing these policies or their effects on migrants (integration in the labour market, language proficiency, etc. ), this aspect goes beyond the scope of this article. The main objective of our article therefore consists in carrying out a systematic review of the situation in Brussels and explaining the specificities. 7Competence in the area of the policy for the reception and integration of immigrants has been the object of many transfers [Adam, 2013a: 11-17; Adam & Jacobs, 2014] due to the dissociative federalism [Alen, 1994; Behrendt & Bouhon, 2009: 358; Verdussen, 2011] which exists in Belgium. From an institutional point of view, while the policy for the reception and integration of immigrants has been a competence of the Communities since 1980, the French-speaking community transferred this competence to the Walloon Region and the French Community Commission (COCOF) in Brussels in 19933 [Clement & Van de Putte, 2007]. Strictly speaking, there is no equivalent for the Dutch-speaking community in Brussels: the Flemish Community is still the competent authority. 8This institutional set-up – and in particular the role of COCOF – must be in keeping with the historical, political and legal will not to create sub-nationalities in Brussels [Dumont & Van Drooghenbroeck, 2011; Dumont, 2012a]. This has required the implementation of a complex system which refers to institutions rather than to people for matters of the two Communities, which are competent in the same territory. Thus, in order to avoid dividing the inhabitants of Brussels into sub-nationalities, which would tie individuals permanently to one of the communities, “the Constitution (art. 127 and 128) provides for a solution according to which, in the bilingual region of Brussels-Capital, the French and Flemish Communities are competent, not regarding people, but regarding the institutions aimed at French- and Dutch-speakers respectively” [de Jonghe & Doutrepont, 2012: 49]. the Flemish Community (Vlaamse Gemeenschap, VG) is at the helm in Flanders and its inburgering policies also apply to the territory of the Brussels-Capital Region, with certain adaptations which have become necessary due to the division of competences explained above. since 1993, the French Community Commission (Commission communautaire française, COCOF) has had legislative power in the matters which were transferred to it by the French Community (social action policies, such as the integration of immigrants). Contrary to its Flemish counterpart (VGC), COCOF has true decretal power (legislative) in the matter. It may therefore develop ad hoc policies autonomously, specifically intended for French-language institutions in Brussels. COCOF is therefore at the helm in the French-speaking community regarding policies for the reception and integration of new immigrants in Brussels. the Flemish Community Commission (Vlaamse Gemeenschapcommissie, VGC) is the go-between for policies of the Flemish Community in Brussels. Contrary to COCOF, this federated entity has kept its initial way of functioning (namely as the interlocutor and operator of Flemish community policies in Brussels) and has not benefited from a transfer of competence. It therefore does not have decretal power to develop specific policies. the Joint Community Commission (COCOM) is competent in Brussels regarding bilingual institutions and people in certain cases. On the one hand, it is competent as regards all of the institutions involved in personal matters, which – due to their bilingual organisation – are not under the remit of the French Community or the Flemish Community. On the other hand, it is competent as regards personal matters which are not devolved to the French and Flemish Communities, with a possibility for direct intervention with people, resulting in rights or obligations. Table 1. 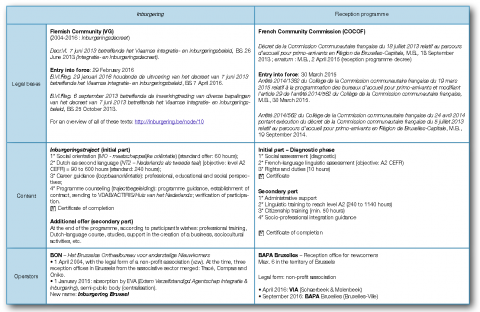 Summary of the competent institutions in the area of integration in Brussels. Each commission has an assembly and an executive (the college), made up of the elected representatives and ministers of the Brussels Region from the language regime concerned. 10Competence regarding the integration of immigrants is therefore divided in Belgium according to the following distribution: in the northern part of the country, it has been taken care of by the Flemish Community since 1980. In the southern part of the country, as regards the French-speaking region, the Walloon Region has been in charge of the integration of immigrants following the transfer in 1993.4 The German Community is competent in the German-speaking region. While it is formally competent as regards the policy for the reception and integration of immigrants, at this stage it has not implemented an integration programme. In Brussels, in the Dutch-speaking community, the Flemish Community is in charge of integration policies, directed by VGC. In the French-speaking community, COCOF has its own legislative power (decretal) and may implement a reception programme autonomously. Finally, the federal and European levels may also intervene. 11For more than ten years, the only available offer in Brussels in terms of an integration programme as such has been that of the Dutch-speaking community. In the capital city, the Flemish Community has offered the same integration programme as in Flanders, namely inburgering, which was implemented in 2004.5 This is still the case, with a new decree which merged the sectors of integration and inburgering (Integratie- en Inburgeringsdecreet6). A Flemish department is in charge of implementing inburgering in Brussels. One difference should nevertheless be pointed out: the Flemish authorities are not able to force the inhabitants of Brussels to take the inburgering programme, as they are not competent due to the institutional architecture of Brussels. In the French-speaking community, a 2004 decree on social cohesion7 proposes various measures which are not intended exclusively for newcomers. It is based essentially on the existing initiatives at local and association level. The situation evolved significantly in July 2013 when COCOF adopted a decree, which came into effect in March 2015, introducing a French-language reception programme for newcomers.8 The decree was thus operationalised in 2016 with the opening of several reception offices (BAPAs). 12Two different and independent programmes – Dutch-language and French-language – now exist alongside one another in Brussels. They may be described and compared at different levels: their respective contents (section 2.1), the operators in charge of their implementation (2.2), their target public and the available offer (2.3) and, finally, the budgetary means available (2.4) (see table 2 for a summary). Table 2 – part 1. 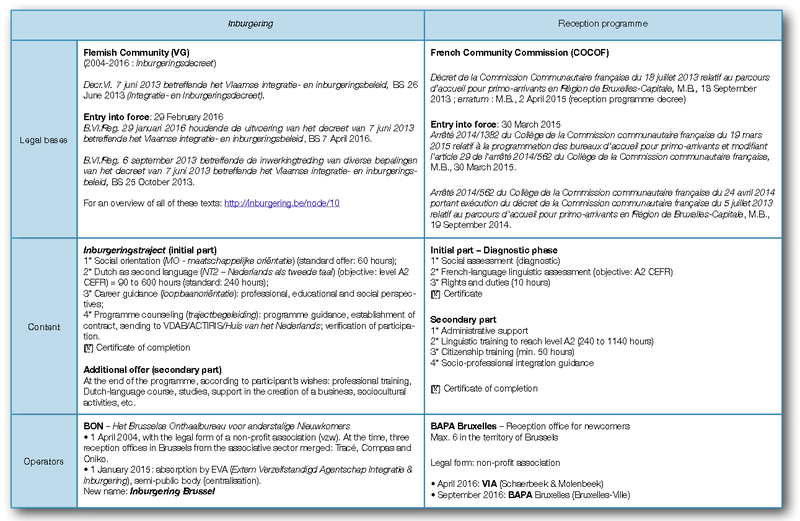 Comparison between the Brussels integration and reception programmes. Table 2 – part 2. Comparison between the Brussels integration and reception programmes. 9 Art. 28 Integratie- en Inburgeringsdecreet. 10 Art. 29, § 1, al. 2 Integratie- en Inburgeringsdecreet. Art. 23-27 B.Vl.Reg. 29 January 2016. 12 Art. 29, § 1, al. 3 Integratie- en Inburgeringsdecreet. Art. 28-30 B.Vl.Reg. 29 January 2016. 13 See: http://www.coe.int/t/dg4/linguistic/cadre1_fr.asp (retrieved on 24 April 2016). 14 Art. 30 Integratie- en Inburgeringsdecreet; Art. 31-32 B.Vl.Reg. 29 January 2016. 13In the Dutch-speaking community, the programme offered in Brussels has the same aspects as the one offered in Flanders. An inburgeringstraject is based on four main lines, established in a civic integration contract.9 Firstly, the participant must take social orientation courses (maatschappelijke oriëntatie,10 MO, standard offer of 60 hours). These lessons focus on the basic knowledge which should allow everyone to participate actively in Flemish society [Cherroud, 2009: 6]. These courses also include a cultural aspect, as the values and norms in Flemish society are also taught.11 Secondly, the programme includes basic Dutch courses (NT2):12 language is considered as a major factor for integration in society. The duration of these courses (between 90 and 600 hours) – which must allow participants to reach level A2 of the Common European Framework of Reference for Languages (CEFR)13 – depends on the level of schooling and initial proficiency in Dutch as well as the learning abilities of participants. Thirdly, the participants also benefit from career guidance in order to open certain perspectives (professional, educational and social). Fourthly, throughout the programme, each participant receives support from a counsellor14 in order to guide them through the programme, establish and follow their civic integration contract, offer assistance, verify attendance, etc. 15 Art. 19, § 2 et art. 20 B.Vl.Reg. 29 January 2016. 16 See section 2.2 of the present publication. 14At the end of these different modules, the participant may receive a civic integration certificate. Originally, this entailed a best-effort obligation (attending at least 80% of classes). Since the entry into force of the new Flemish decree on 29 February 2016, a performance obligation also exists15 [Ganty & Delgrange, 2015]. As explained by the Flemish agency Integratie en Inburgering16 [2016: 22]: “Concreet zal het inburgeringsattest enkel nog worden uitgereikt aan wie geslaagd is voor MO en NT2”.17 In reality, success in the MO module will be evaluated based on regular and active participation (evaluated on an ongoing basis), the establishment of a plan of action and the carrying out of two of the actions included in the latter (evaluation at the end of the programme) [Agentschap Integratie en Inburgering, 2016: 22]. 15Following the inburgeringstraject, the participant (inburgeraar) has the possibility to continue learning in order to participate fully in society18 (for example, undergo professional training, take additional Dutch courses, pursue studies, etc.). 20 Art. 10 of decree 2014/562. 22 Art. 18 of decree 2014/562. 23 Art. 16 of decree 2014/562. 24 Art. 7 of the reception programme decree, art. 20 of decree 2014/562. 17The programme in the Dutch-speaking and French-speaking communities therefore have distinct requirements and are organised differently, in particular regarding the division of the different parts. Thus, the division between the initial and secondary parts is not the same and may lead to some confusion. In practice, the initial part offered by VG should not be compared to the first part offered by COCOF, but rather to both of its parts as a whole. Thus, the Flemish secondary part, which is implemented by regular structures which are not specific to new immigrants, is the equivalent of socio-professional guidance, social cohesion, etc. in the French-speaking community. This question is raised especially regarding the recognition of certificates awarded in the framework of the integration or reception programmes (see section 3.3.). 18Since 2004, the operationalisation of inburgering in Brussels is carried out through the intermediary of BON.25 This is the Brussels office in charge of civic integration, financed by VG. It played a major role for more than ten years, while maintaining its uniqueness with respect to the other Flemish integration bodies.26 However, after ten years of existence, since 1 January 2015, this reception department – which had existed previously as a non-profit association – was absorbed by a Flemish “super-agency”27 and became Inburgering Brussel. In fact, all of the Flemish reception offices and Flemish integration centres – except in Ghent and Antwerp – were merged into a semi-public body: a private and autonomous externalised agency28 (Extern Verzelfstandigd Agentschap (EVA) Integratie & Inburgering) [Van den Broucke et al., 2016: 21]. 19In the framework of this merger, a debate has divided certain politicians from VGC and the Flemish authorities. Brigitte Grouwels29 (CD&V) pleaded for a exceptional status for Brussels, like Ghent or Antwerp, as Brussels represents a special situation, in particular due to its bilingual character and the diversity of its population.30 She wanted VGC to be directly responsible for this policy and its directions. In the end, Brussels was not granted an exceptional status outside EVA31 but obtained a special status all the same, as VGC plays the role of “director”32 of social and civic integration policies in the Brussels territory. 34 Report No 23, 13 November 2015: 15-17. 37 Art. 22 of decree 2014/562. 39 Report No 35, 17 June 2016: 17. 40 Report No 35, 17 June 2016: 18. He also maintained that the objective is not to create competition between the BAPAs but to create a local rooting in order to favour projects in the field, accounting for differences between the communities and meeting the different needs which arise.40 Nevertheless, it is necessary to follow the evolution of this coordination so that practices do not become more heterogeneous, and the offer, more fragmented or even competitive. 41 Art. 26-27 Integratie- en Inburgeringsdecreet. 44 Art. 2 reception programme decree. 46 Newcomers who are of age, are under age 65 and who did not have EU nationality on 1 January 2015. 23In the French-speaking community, the reception programme will be accessible to people of foreign nationality over the age of 18 who have lived in Belgium legally for less than three years and who have a residence permit for more than three months.44 According to a study [Ansay et al., 2012], more than 120 000 people fit this definition. On a yearly basis, Brussels has more than 30 000 newcomers,45 11 000 of whom are non European.46 This figure is particularly significant because it serves as a standard for the target public in the case of the compulsory programme implemented by a COCOM ordinance. In fact, due to the principle of free movement in the European Union, only third country nationals, with some exceptions, may be forced to take an integration programme. 24This difference should be pointed out: in the case of the French-speaking community, the target group is limited with respect to its Flemish counterpart, as only the newcomers who have been present for less than three years and who are of foreign nationality may take the programme. Generally speaking, at this stage, the integration offer in Brussels is estimated to be available to 7 000 people, according to the following distribution: 4 000 for the two BAPAs (when they will be fully operational) and 3 000 for BON. 50 Actuele vraag nr. 137, 13 January 2016; Vraag om uitleg nr. 780, 24 February 2016. 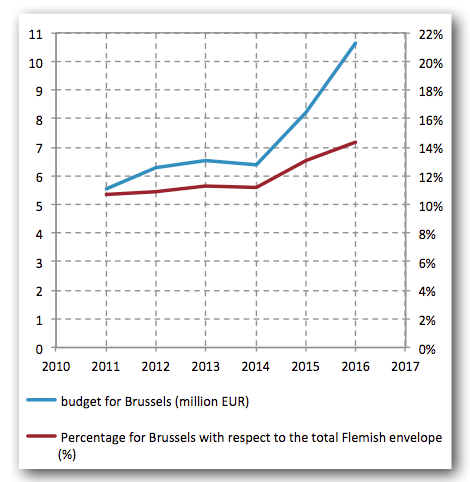 Figure 1. Financing of integratie en inburgering matters by the Flemish Community: budget for Brussels and relationship between the budget allocation in Brussels and the total Flemish budget. After 2014, the method of financing was modified due to the implementation of EVA’s Integratie en Inburgering. The non-profit associations in Brussels (BON, FOYER, Brussel Onthaal) no longer receive their own grants, but instead receive a share of the Flemish agency’s global budget intended for Brussels. As of 1 January 2016, the Huis van het Nederlands Brussel has also been financed by the Integratie en Inburgering funds, receiving 1,307,680 euros. This budget also included financing for the Inburgering Brussel office. However, the specific grants for 2016 which are not yet known must also be added. The increase with respect to the 2015 budget is mainly attributable to the additional means released in the framework of the asylum crisis. 52 Vraag nr. 780, 24 February 2016. 53 Report No 25, 11 December 2015: 15. 27The communities must therefore give themselves the means to fulfil their ambitions, but are faced with structural budgetary restrictions. The offer by the French-speaking community is quite limited at this stage, but the budgetary envelope will have to increase considerably. In the Dutch-speaking community, the investments continue to increase, with a significant share for Brussels despite the creation of EVA whose objective was to rationalise costs. The budgetary challenge will only be greater if the programme becomes compulsory and the Dutch-speaking and French-speaking communities have to share the costs. 28The Belgian institutional structure has strongly determined the options of political stakeholders in Brussels concerning the integration of newcomers. This complex architecture has several consequences. Firstly, it makes cooperation between the different federated entities arduous (with tensions felt in this matter as well). Secondly, it complicates the implementation of a compulsory (reception or integration) programme in the territory of Brussels. Thirdly, it has many consequences for the recipients of these measures, namely the migrants. 29First of all, an initial difficulty concerns the asymmetry of the competent institutions, which leads to an increase in the number of political decision-makers. In the Dutch-speaking community, the competent institution is the Flemish Community (which merged with the Flemish Region). It is a single and strong political stakeholder. Inburgering constitutes a specific portfolio, and the Flemish Minister Liesbeth Homans (N-VA) is currently in charge of this matter. EVA’s Integratie en Inburgering54 is now a stakeholder to consider as well, as this agency is responsible for the operationalisation of inburgering and, above all, absorbed BON. For its part, VGC is not autonomous in this matter and must collaborate with EVA as a “director”. Time will tell what VGC’s true influence in this matter will be. As regards the French-speaking community in Brussels, COCOF is the competent institution, and social cohesion is currently in the portfolio of Minister Rudi Vervoort (PS) who is Minister-President of the Brussels-Capital Region. At the level of COCOM, the portfolio is the joint responsibility of Céline Fremault (cdH) and Pascal Smet (sp.a). The implementation of a coherent reception and integration policy in Brussels requires the collaboration of all of these stakeholders. This would be even more necessary if the political decision-makers wish to make the programme compulsory in Brussels via COCOM (see section 3.2). This cooperation is not a given, in particular as the Flemish decision-makers in Brussels who make up COCOM (and VGC) are sometimes in an awkward position with respect to their Flemish counterparts. Their careers do not take place at the same level of authority (Brussels-Capital Region vs. Flanders), and the coalitions for the 2014-2019 legislature are not identical (in Brussels, Open-VLD, sp.a, CD&V, and in Flanders, N-VA, CD&V, Open-VLD). 55 Art. 27, §1, 1°, a) and b) Integratie- en Inburgeringsdecreet. 56 See the statements made in the newspaper De Standaard: [Vergauwen & Justaert, 25 April 2015]. 30More globally, at national level, difficulties emerge regarding intra-federal mobility and the recognition of programmes by the different federated entities. In this case, the new Flemish decree now provides that newcomers who first live in Brussels and Wallonia and who then move to Flanders within five years following their arrival in Belgium, are also required to take the inburgeringstraject.55 What is the situation now that a less demanding French-language programme exists in Brussels (and in Wallonia)? In April 2015, the spokesperson for Minister Homans declared: “When the other programmes have been implemented, it will be necessary to reconsider the measure. But even if there is a compulsory integration programme in Wallonia, it may still be useful to maintain compulsory integration in Flanders.”56 The integration matter is no exception in a Belgian federal state, torn by centrifugal factors [Dumont, 2012b]. 31Due to the assignment of powers and the will not to create sub-nationalities in Brussels, the Dutch-language and French-language decision-makers were faced with a true problem when they wished to make their integration or reception programmes compulsory. 32As a pioneer in the matter, the Flemish Community was the first to run into this difficulty, as it chose to make inburgering compulsory in Flanders as of 2004, but is not able to do the same in Brussels. In the French-speaking community, it was first necessary for the idea of a reception programme to be recognised. While the Brussels opposition (MR) had already had the occasion as of 2003 to make several proposals in this area,57 for the first time, during the summer of 2012, the more left-wing parties in control of the executive (PS-Ecolo-cdH for the 2009-2014 legislature) put this policy on their agenda. The French-language reception programme was finally adopted in 2013 [Adam, 2013c] and the idea of the compulsory character gained recognition gradually. Let us underline that this was a Copernican revolution in the French-speaking community’s integration philosophy, which was based traditionally on a more republican and universalist model [Jacobs & Rea, 2007; Adam, 2013a,b]. 34The institutional puzzle, which leads to the existence of two different programmes in the same territory, has consequences for the beneficiaries of these programmes, namely the new immigrants. At certain levels, they become the hostages of a very complicated system. If the mysteries of the federal system are already difficult for initiates to understand, it is very likely that the situation should seem inextricable to a newcomer who is of course unfamiliar with Belgian institutional architecture. Furthermore, this established fact creates the requirement for an ethnolinguistic positioning of newcomers, who must “choose their side” and arbitrate between the Dutch-language and French-language offers [Xhardez, 2014: 343]. Which criteria will they use to make their choice? It would be detrimental for them to be prisoners of a competition between the entities, with different offers, seeking to attract the largest numbers or – on the contrary, perhaps for budgetary reasons – the smallest numbers. Furthermore, as mentioned above, the heterogeneity of offers could lead to different qualities of training, once again to the detriment of new immigrants. Objectively, one may even wonder if this situation ends up creating two different citizenships in the same territory, further fragmenting the figure of the citizen in Belgium. As soon as the programme was implemented in Flanders, Sébastien Van Drooghenbroeck  questioned the de facto creation of federated citizenships within the federal state. His questions are all the more pertinent today due to the increasing number of integration programmes. 66 Interview with David Cordonnier, 22 August 2016. 36As a reminder, the procedure in the matter is as follows (art. 15 of the Nationality Code): the Registrar collects the documents when the declaration is made and verifies that the file is complete. Then the Public Prosecutor’s Office, the Immigration Office and the State Security are asked to deliver an opinion within four months on the potential absence of criteria to be met in order to benefit from this procedure, and on the possible existence of a hindrance resulting from serious personal matters. The Public Prosecutor must therefore deliver a positive or negative opinion. In the absence of an implementation decree or directives from the Minister of Justice, we will have to see which practices will prevail among Registrars and different Public Prosecutors: will they recognise COCOF certificates? In Brussels, Minister Rudi Vervoort wrote a letter to the Public Prosecutor of Brussels67 to present the COCOF integration measures (at the level of the reception programme as well as some provided for by social cohesion). In accordance with the separation of powers, it is, however, the judicial power which is in charge. Let us underline that this is an eminently political issue: at federal and regional levels, different majorities exist, which are likely to have contrasting requirements regarding the necessary content of these “integration courses”, as well as, more generally, the meaning of nationality itself. Will this system lead to easier access to nationality which will vary according to the “course” taken? The situation will inevitably become clearer. 37In Brussels, the institutional imbroglio complicates the already sensitive matter of the reception of new immigrants and their support. The refugee crisis in Europe – and especially in its capital – and the question of their integration in society in the coming years, have made matters worse for this institutional and political muddle. There is still a lack of understanding and some dissension coming from both sides. 38On the one hand, the decision-makers from the Dutch-speaking community demand that the French-speaking community should take responsibility and act accordingly, underlining that they are more than ten years behind in this matter and that they should follow their well-established example. On the other hand, the decision-makers from the French-speaking community sometimes seem to get ahead of themselves – as there are insufficient means for the moment and operationalisation requires time – while trying to dissociate themselves from a Flemish programme68 which they have criticised in the past. However, the road to collaboration is now open within COCOM, even if the most delicate arbitrations still need to take place: budget distribution, harmonisation of contents (by establishing the smallest common denominator? ), definition of target groups, implementation of a system of control and sanctions, recognition of certificates by other entities and levels of power, etc. 39In these arbitrations, we must not lose sight of the interests of migrants themselves so that they do not become hostages of a very (overly?) complicated system. Adam, Ilke, 2013a. Les entités fédérées belges et l’intégration des immigrés. Brussels: Editions de l’Université de Bruxelles. Adam, Ilke, 2013b. Immigrant Integration Policies of the Belgian Regions: Sub-state Nationalism and Policy Divergence after Devolution. In: Regional & Federal Studies. 2013. Vol. 23, No 5, pp. 547-569. Adam, Ilke & Jacobs, Dirk, 2014. Divided on Immigration, Two Models for Integration. The Multilevel Governance of Immigration and Integration in Belgium. In : HEPBURN, Eve, ZAPATA-BARRERO, Ricard (ed.). The Politics of Immigration in Multi-Level States. Governance and Political Parties. Basingstoke: Palgrave MacMillan. pp. 65-85. Adam, Ilke & Martiniello, Marco, 2013. Divergences et convergences des politiques d’intégration dans la Belgique multinationale. Le cas des parcours d’intégration pour les immigrés. In: Revue européenne des migrations internationales. 2013. Vol. 29, No 2, pp. 77-93. ALEN, André, 1994. Le fédéralisme. Approches politique, économique et juridique. Brussels: De Boeck-Université. ANSAY, Alexandre, EGGERICKX, Thierry, MARTIN, Elisabeth, SCHOONVAERE, Quentin, UNGER, Jonathan, 2012. Etat des lieux de la situation des primo-arrivants en Région de Bruxelles-Capitale. CBAI-UCL. BATSELE, Didier, MORTIER, Tony & SCARCEZ, Martine, 2014. Initiation au droit constitutionnel. Brussels: Bruylant, 2nd édition. BAUBÖCK, Rainer & JOPPKE, Christian (ed. ), 2010. How liberal are citizenship tests? Florence: EUI. Working Paper. BEHRENDT, Christian, BOUHON, Frédéric, 2009. Introduction à la théorie générale de l’Etat. Brussels: Larcier. BON VZW – INBURGERING BRUSSEL, 2014, Rapport annuel 2013. Brussels. Bon. 27 p.
BON VZW – INBURGERING BRUSSEL, 2015, Rapport annuel 2014. Brussels. Bon. 22 p.
BRUBAKER, Rogers, 1992. Citizenship and Nationhood in France and Germany. Cambridge-Massachusetts: Harvard University Press. BRUBAKER, Rogers, 2001. The return of assimilation ? Changing perspectives on immigration and its sequels in France, Germany, and the United States. In: Ethnic and Racial Studies, 2001. Vol. 24, No 4, pp. 531-548. CARENS, Joseph, 2005. The Integration of Immigrants. In: Journal of Moral Philosophy, 2005, Vol. 2, No 1, pp. 29-46. CARRERA, Sergio, GUILD, Elspeth & GROENENDIJK, Koen (ed), 2009. Illiberal Liberal States: Immigration, Citizenship and Integration in the EU. Hampshire: Ashgate Publishing. CHERROUD, Karim, 2009. Inburgering. Toelichting aan de hand van de regelgeving. Brussels. CIRE, 2015. Primo-arrivants bruxellois : deux parcours pour une même intégration ? Bruxelles. Coordination et initiatives pour réfugiés et étrangers. 7 p.
CLEMENT, Jan & VAN DE PUTTE, Mieke, 2007. De bevoegdheidsverdeling inzake vreemdelingen en allochtonen. In: JUDO, Frank et GEUDENS, Godfried (ed. ), Burgerschap, inburgering, migratie. Gent: Larcier. pp. 27-46. COCOM, 2014. Déclaration politique du collège réuni de la commission communautaire commune. Bruxelles. 20 July 2014. DE JONGHE, Delphine & DOUTREPONT, Marie, 2012. Obtention de la nationalité et volonté d’intégration. In: Courrier hebdomadaire du CRISP. 2012. Vol. 27-28, No 2152-2153, pp. 1-76. DELGRANGE, Xavier & EL BERHOUMI, Mathias, 2015. Le découpage des compétences régionales et communautaires à Bruxelles ou la tentation de la transgression. In: DE BROUX, Pierre-Olivier, LOMBAERT, Bruno & YERNAULT, Dimitri, Le droit bruxellois. Un bilan après 25 ans d’application (1989 - 2014). Brussels: Larcier, 2015. pp. 67-98. DUMONT, Hugues, 2012a. Het statuut van Brussel: de perken van de onvermijdelijke complexiteit. In: POPELIER, Patricia, VELAERS, Jan & CANTILLON, Béa (ed. ), België, quo vadis ? Waarheen na de zesde staatshervorming ? Antwerpen-Cambridge: Intersentia. pp. 157-173. DUMONT, Hugues, 2012b. Un impossible dialogue ? Deux communautés dans la tourmente. In: VON BUSEKIST, Astrid (ed. ), Singulière Belgique. Paris: Fayard, pp. 29-45. DUMONT, Hugues, Van Drooghenbroeck, Sébastien, 2011. L’interdiction des sous-nationalités à Bruxelles. In: Administration Publique. 2011. Vol. 3, No 3, pp. 201-227. GANTY, Sarah & DELGRANGE, Pauline, 2015. Heurs et malheurs des parcours d’accueil et d’intégration des étrangers en Belgique. In: Revue du droit des étrangers. 2015. No 185, pp. 511-528. GOODMAN, Sara & WRIGHT, Matthew, 2015. Does Mandatory Integration Matter? Effects of Civic Requirements on Immigrant Socio-economic and Political Outcomes. In: Journal of Ethnic and Migration Studies. 2015. Vol. 41, No 12, pp. 1885-1908. GOODMAN, Sara, 2010. Integration Requirements for Integration’s Sake ? Identifying, Categorising and Comparing Integration Policies. In: Journal of Ethnic and Migration Studies. 2010. Vol. 36, No 5, pp. 753-772. GOODMAN, Sara, 2014. Immigration and Membership Politics in Western Europe. Cambridge: Cambridge University Press. Jacobs, Dirk & Rea, Andrea, 2007. The End of National Models? Integration Courses and Citizenship Trajectories in Europe. In: International Journal on Multicultural Societies. 2007. Vol. 9, No 2, pp. 264-283. JACOBS, Dirk, 2000. Multinational and Polyethnic Politics entwined: Minority Representation in the Region of Brussels-Capital? In: Journal of Ethnic and Migration Studies. 2000, Vol. 26, No 2, pp. 289-304. JOPPKE, Christian, 2007. Transformation of Immigrant Integration: Civic Integration and Antidiscrimination in the Netherlands, France, and Germany. In: World Politics. 2007. Vol. 59, No 2, pp. 243–273. JOPPKE, Christian, 2010. Citizenship and immigration. Cambridge: Polity Press. KOSTAKOPOULOU, Dora, 2010. The Anatomy of Civic Integration. In: The Modern Law Review. 2010. Vol. 73, No 6, pp. 933-958. MICHALOWSKI, Ines & VAN OERS, Ricky, 2012. How Can We Categorise and Interpret Civic Integration Policies ? In: Journal of Ethnic and Migration Studies. 2012. Vol. 38, No 1, pp. 163-171. MICHIELSEN, Joris, VAN DE POL, Sanne, DE CUYPER, Peter & WAUTERS, Joris, 2014. 10 jaar Vlaams inburgeringsbeleid: inburgering in een diversifiërende context. In: BENYAICH, Bilal (ed. ), Klokslag twaalf. Tijd voor een ander migratie- en integratiebeleid. Brussels: Itinera Institute. pp. 69-93. Mouritsen, Per, 2008. Political Responses to Cultural Conflict: Reflections on the Ambiguities of the Civic Turn. In: MOURITSEN, Per & Jørgensen, Knud Erik (ed. ), Constituting Communities. Political Solutions to Cultural Conflict. London: Palgrave, pp. 1-30. Triadafilopoulos, Triadafilos, 2011. Illiberal Means to Liberal Ends? Understanding Recent Immigrant Integration Policies in Europe. In: Journal of Ethnic and Migration Studies. 2011. Vol. 37, No 6, pp. 861-880. VAN DEN BROUCKE, Sarah, NOPPE, Jo, STUYCK, Karen, BUYSSCHAERT, Philippe, DOYEN, Gerlide en WETS, Johan, 2015. Vlaamse Migratie- en Integratiemonitor 2015. Brussels: Steunpunt Inburgering en Integratie & Agentschap Binnenlands Bestuur, 2015, 257 p.
Van Drooghenbroeck, Sébastien, 2006. Fédéralisme, droits fondamentaux et citoyenneté : les certitudes à l’épreuve de l’inburgering. In: BREMS, Eva, STOKX, Ruth & ABICHT, Ludo (ed. ), Recht en minderheden. De ene diversiteit is de andere niet. Brugge: die Keure, pp. 247-274. VERDUSSEN, Marc, 2011. La Belgique : un fédéralisme bipolaire mû par une dynamique de dissociation. In: SEYMOUR, Michel & LAFOREST, Guy (ed. ), Le fédéralisme multinational. Un modèle viable ? Bruxelles: P.I.E. Peter Lang, pp. 211-225. VLAAMSE OVERHEID, 2010. Inburgering : les cours d’intégration en Flandre et à Bruxelles. XHARDEZ, Catherine, 2014. Les différentes routes de l’intégration sur une nouvelle terre d’immigration. In: Outre-Terre. 2014, Vol. 3, No 40, pp. 333-343. XHARDEZ, Catherine, 2015. Volonté d’apprendre le néerlandais et suivi du parcours d’intégration : le point sur les conditions d’admission des locataires sociaux en Flandre. In: Administration publique. 2015, Vol. 3, pp. 436-446. BELGA, (2016), Bruxelles : étape importante pour le parcours d’accueil obligatoire des primo-arrivants. In: RTBF.be, 15 April 2016. BERSIPONT Ann-Charlotte, (2016), Parcours d’intégration obligatoire : arrivée prévue en 2017 à Bruxelles. In: Le Soir, 17 February 2016. BRABANT François, (2015), Rendons obligatoire le parcours d’intégration à Bruxelles, interview de Laurette Onkelinx. In: La Libre Belgique, 2 October 2015, pp. 4-5. VAN GARSSE Steven (2001), Inburgering op Vlaamse leest : geen uitzondering voor Brussel. In: Brussel nieuws.be, 30 October 2011. VAN GARSSE Steven, (2011), Grouwels aan Bourgeois : “Inburgering en integratie is ons werk”. In: Brussel nieuws.be, 21 December 2011. VERGAUWEN Eveline & JUSTAERT Marjan, (2015), Ook Waalse migranten moeten inburgeren volgens Homans. In: De Standaard, 24 April 2015. VERGAUWEN Eveline & JUSTAERT Marjan, (2015), De ene (niet zo) nieuwe inwoner is de andere niet. In: De Standaard, 24 April 2015. X, (2016), Parcours obligatoire pour les primo-arrivants. In: La Capitale, 18 April 2016, pp. 10-11. YCS, (2016), Verplicht Inburgeringstraject. In: Het Nieuwsblad/Regionaal: Brussel-Noordrand, 19 April 2016, pp. 4-5. N.B. The legal references related to the Flemish legislation are in keeping with the V&A legal reference system (Interuniversitaire Commissie Juridische Verwijzingen en Afkortingen). Loi spéciale du 8 août 1980 de réformes institutionnelles, M.B., 15 August 1980. Loi du 4 décembre 2012 modifiant le Code de la nationalité belge afin de rendre l’acquisition de la nationalité belge neutre du point de vue de l’immigration, M.B., 14 December 2012. Décret spécial de la Communauté française du 19 juillet 1993 attribuant l’exercice de certaines compétences de la Communauté française à la Région wallonne et à la Commission communautaire française, M.B., 10 September 1993. Decr.Vl. 28 februari 2003 betreffende het Vlaamse inburgeringsbeleid, BS 8 May 2003. Décret de la Commission communautaire française du 13 mai 2004 relatif à la cohésion sociale, M.B., 23 March 2005. Décret de la Commission communautaire française du 18 juillet 2013 relatif au parcours d’accueil pour primo-arrivants en Région de Bruxelles-Capitale, M.B., 18 September 2013. Décret de la Région wallonne du 27 mars 2014 remplaçant le livre II du Code wallon de l’Action sociale et de la Santé (CWASS) relatif à l’intégration des personnes étrangères ou d’origine étrangère, M.B., 18 April 2014. Arrêté 2014/562 du Collège de la Commission communautaire française du 24 avril 2014 portant exécution du décret de la Commission communautaire française du 5 juillet 2013 relatif au parcours d’accueil pour primo-arrivants en Région de Bruxelles-Capitale, M.B., 19 September 2014. Arrêté 2014/1382 du Collège de la Commission communautaire française du 19 mars 2015 relatif à la programmation des bureaux d’accueil pour primo-arrivants et modifiant l’article 29 de l’arrêté 2014/562 du Collège de la Commission communautaire française, M.B., 30 March 2015. B.Vl.Reg. 17 juli 2015 tot toekenning van taken en kerntaken aan een vereniging zonder winstoogmerk als vermeld in artikel 25, § 1, eerste lid, 3°, van het decreet van 7 juni 2013 betreffende het Vlaamse integratie en inburgeringsbeleid, BS 17 August 2015. Samenwerkingsovereenkomst tussen de Vlaamse Gemeenschapscommissie (VGC) en het extern verzelfstandigd Agentschap Integratie en Inburgering du 26 novembre 2015 (http://bestanden.vgc.be/collegebesluiten/2015/2015-11/cbbij1-1516-0050.pdf). B.Coll.Vl.Gem.Comm. nr. 20152016-0050, 26 November 2015, bijlage nr. 1. Proposition de décret créant un parcours d’intégration individuel à l’attention des primo-arrivants adultes déposée par Mme Françoise Schepmans et M. Serge de Patoul. Parlement francophone bruxellois (Assemblée de la Commission communautaire française). Rapport fait au nom de la commission des Affaires sociales par Mme Nathalie Gilson et Mme Olivier P’tito, 8 December 2004. Session 2004-2005. Proposition de décret portant création d’un contrat bruxellois d’intégration et de participation déposée par Mme Françoise Schepmans, M. Philippe Pivin, M. Serge de Patoul et Mme Gisèle Mandaila. Parlement francophone bruxellois (Assemblée de la Commission communautaire française). Rapport fait au nom de la commission des Affaires sociales par M. Gaëtan Van Goidsenhoven et M. Alain Maron, 2 July 2013. Session 2012-2013. Integraal verslag nr. 12 van de vergadering van vrijdag 15 juni 2012. De Raad van de Vlaamse Gemeenschapcommissie. Zitting 2011-2012. pp. 413-444. Compte-rendu no 22 de la séance plénière du 30 octobre 2015. Parlement francophone bruxellois (Assemblée de la Commission communautaire française). Session 2015-2016. 39 p.
Vraag nr. 595 van 24 maart 2015 van Karl Vanlouwe (antw. Liesbeth Homans). Vlaams Parlement. Vraag nr. 618 van 31 maart 2015 van Karl Vanlouwe (antw. Liesbeth Homans). Vlaams Parlement. Compte-rendu n°20 de la séance plénière du 23 septembre 2015. Parlement francophone bruxellois (Assemblée de la Commission communautaire française). Session 2015-2016. 35 p.
Compte-rendu n°23 de la séance plénière du 13 novembre 2015. Parlement francophone bruxellois (Assemblée de la Commission communautaire française). Session 2015-2019. 33 p.
Compte-rendu n°25 de la séance plénière du 11 décembre 2015. Parlement francophone bruxellois (Assemblée de la Commission communautaire française). Session 2015-2016. 115 p.
Actuele vraag nr. 137 van Karl Vanlouwe aan minister Liesbeth Homans over het overleg met de Brusselse Regering betreffende de verplichte inburgering in de hoofdstad. 13 januari 2016, Plenaire vergadering. Vlaams Parlement. Vraag om uitleg nr. 780 van Joris Poschet aan minister Sven Gatz. Commissievergadering om uitleg over de inburgering in Brussel. Commissie voor Brussel en de Vlaamse Rand. 24 februari 2016, Plenaire vergadering 10.05u. Vlaams Parlement. Compte-rendu n°29 de la séance plénière du 26 février 2016. Parlement francophone bruxellois (Assemblée de la Commission communautaire française). Session 2015-2016. 32 p.
Vraag nr. 402 van 26 februari 2016 van Elke Van den Brandt (antw. Liesbeth Homans). Vlaams Parlement. Vraag nr. 598 van 8 juni 2016 van Karl Vanlouwe (antw. Liesbeth Homans). Vlaams Parlement. Compte-rendu no 35 de la séance plénière du 17 juin 2016. Parlement francophone bruxellois (Assemblée de la Commission communautaire française). Session 2015-2016. 22 p.
1 SPF Economie, Be Stat (raw data: http://bestat.economie.fgov.be/BeStat/BeStatMultidimensionalAnalysis?loadDefaultId=2911) (retrieved on 24 April 2016). 2 The latest update of this article took place on 24 August 2016 and does not take into account the legislative changes, political options or media announcements which have occurred since this date. 3 The exercise of jurisdiction referred to in art. 5, par. 1, II, 3° (reception and integration of immigrants) of the special law of institutional reforms of 8 August 1980 was transferred by the French Community to the Walloon Region and COCOF, in accordance with article 138 of the Constitution: see art. 3 of the Décret spécial de la Communauté française du 19 juillet 1993 attribuant l’exercice de certaines compétences de la Communauté française à la Région wallonne et à la Commission communautaire française, M.B., 10 September 1993. 4 The Walloon Region now has an integration programme as well. See the décret du 27 mars 2014 remplaçant le livre II du Code wallon de l’Action sociale et de la Santé (CWASS) relatif à l’intégration des personnes étrangères ou d’origine étrangère, M.B., 18 April 2014. 5 This policy was implemented by the decree of the Flemish Community of 28 February 2003 (Decr.Vl. 28 februari 2003 betreffende het Vlaamse inburgeringsbeleid, BS 8 May 2003 (below: Inburgeringsdecreet). This decree came into effect on 1 April 2004 but was replaced by a new decree (see note below). 6 Decr.Vl. 7 juni 2013 betreffende het Vlaamse integratie- en inburgeringsbeleid, BS 26 June 2013 (below: Integratie- en Inburgeringsdecreet). For the entry into force of this decree on 29 February 2016, see: B.Vl.Reg. 29 januari 2016 houdende de uitvoering van het decreet van 7 juni 2013 betreffende het Vlaamse integratie- en inburgeringsbeleid, BS 7 April 2016 (below: B.Vl.Reg. 29 January 2016). 7 Décret de la Commission communautaire française du 13 mai 2004 relatif à la cohésion sociale, M.B., 23 March 2005. 8 Décret de la Commission communautaire française du 18 juillet 2013 relatif au parcours d’accueil pour primo-arrivants en Région de Bruxelles-Capitale, M.B., 18 September 2013 (below: reception programme decree). 11 ‘Having knowledge and competence is not everything; values and norms also play a central role. It is essential for the newcomers to know the values and norms which form the basis of Flemish and Belgian society in all of its diversity’ [Vlaamse overheid, 2010 : 6]. 17 Our translation: ‘In concrete terms, the inburgering certificate will be delivered only to those who pass the MO modules in NT2’. 18 Art. 34, al. 2 Integratie- en Inburgeringsdecreet : “Na voltooiing van zijn inburgeringstraject heeft de inburgeraar recht op deelname aan een vervolgaanbod dat aansluit op zijn inburgeringstraject en op zijn levensloopbaan. Het vervolgaanbod beoogt een volwaardige participatie van de inburgeraar in de samenleving”. 19 Art. 7 et 8 de l’arrêté 2014/562 du Collège de la Commission communautaire française du 24 avril 2014 portant exécution du décret de la Commission communautaire française du 5 juillet 2013 relatif au parcours d’accueil pour primo-arrivants en Région de Bruxelles-Capitale, M.B., 19 September 2014 (below: decree 2014/562). 21 Art. 17 of decree 2014/562; see also the addendum: « Annexe 1re – Nomenclature des formations linguistiques en vue d’atteindre le niveau A2 ». 25 Brussels onthaalbureau voor inburgering. Before this, its name was changed several times: Brussels Overleg Nieuwkomers, Brussels Ondersteuningscentrum Nieuwkomers, Brussels Onthaal Nieuwkomers and het Brusselse Onthaalbureau voor anderstalige Nieuwkomers. 26 Interview with Eric de Jonge, 22 April 2014; see the excerpts from the BON annual report: “BON is a pluralist organisation in Brussels which takes full account of the bilingual status and the multilingual reality of the Brussels-Capital Region” [BON, 2014: 5]; ‘the functioning of BON depends greatly on the specific context of Brussels’ and “Brussels is a bilingual/multilingual region where Dutch is a minority language and where civic integration is not yet compulsory” [BON, 2014: 20]. 27 Art. 16-24 Integratie- en Inburgeringsdecreet ; B.Vl.Reg. 21 maart 2014 tot toekenning van taken en kerntaken aan een lokaal bestuur als vermeld in artikel 25, § 1, eerste lid, 1°, van het decreet van 7 juni 2013 betreffende het Vlaamse integratie- en inburgeringsbeleid, BS 11 July 2014. 28 This is a legal form similar to VDAB or Kind en Gezin. This agency was created by the decision of the Flemish government of 22 November 2013 (VLAAMSE REGERING, Vergadering van vrijdag 22 november 2013, PV 2013/48, punt 0037) and its statutes were submitted on 16 December 2013, M.B., 30 December 2013. It is registered with Banque-Carrefour des entreprises with the number 0543.307.391. 29 Within VGC, she was a member of the college in charge of the minority policy (VGC-collegelid voor minderhedenbeleid). 30 See the debates from the VGC council: Integraal Verslag nr. 12, 15 June 2012, in particular pp. 421-422; see also the statements made by Brigitte Grouwels in the press: [Van Garsse, 30 October 2011 & 21 December 2011]. 31 Except het Huis van het Nederlands Brussel and Brussel Onthaal which are not part of the agency Integratie en Inburgering. See B.Vl.Reg. 17 juli 2015 tot toekenning van taken en kerntaken aan een vereniging zonder winstoogmerk als vermeld in artikel 25, § 1, eerste lid, 3°, van het decreet van 7 juni 2013 betreffende het Vlaamse integratie en inburgeringsbeleid, BS 17 August 2015. 32 Concerning the role of director played by VGC, Minister Hoomans indicated that she would return to VGC to determine the political priorities with respect to integration in Brussels, in accordance with the guidelines of the decree. The EVA agency Integratie en Inburgering later took these political priorities into account in its meerjarig beleidsplan (multiannual guidance plan) [Vraag nr. 618, 31 March 2015]. A cooperation agreement (samenwerkingsovereenkomst) was signed between VGC and EVA [Agentschap Integratie en Inburgering, 2016: 67]: B.Coll.Vl.Gem.Comm. nr. 20152016-0050, 26 november 2015, bijlage nr. 1. See in particular art. 10 on the objective of the cooperation: “Beide partijen gaan uit van een kwaliteitsvolle samenwerking met als doelstelling het realiseren van een gecoördineerd, inclusief en horizontaal integratiebeleid in het tweetalig gebied Brussel-Hoofdstad. Het Agentschap erkent de regierol van de VGC, zoals bepaald in artikel 47 van het Decreet van 7 juni 2013 (…).”. 33 See art. 3 de l’arrêté 2014/1382 du Collège de la Commission communautaire française du 19 mars 2015 relatif à la programmation des bureaux d’accueil pour primo-arrivants et modifiant l’article 29 de l’arrêté 2014/562 du Collège de la Commission communautaire française, M.B., 30 March 2015. 35 See, for example, these statements during debates in the French-language Parliament of Brussels [Report No 20, 23 September 2015: 15; report No 23, 13 November 2015: 14]. 36 The partners of the majority in the French Community Commission are PS, CdH and DéFi (formerly FDF). 38 SERVICE PUBLIC FRANCOPHONE BRUXELLOIS, Opérateurs de formation linguistique – parcours d’accueil pour primo-arrivants (appel à projets clôturé). In : spfb.brussels [online]. [Retrieved on 26 August 2016]. 42 Another interesting figure concerns the number of people who have actually received an integration certificate: 1 757 people in 2014 compared to 819 in 2012 [BON, 2015: 6]. 43 Actuele vraag nr. 137, 13 January 2016. In 2015, 3 374 integration contracts were signed and handled by BON [Vraag 402, 26 February 2016]. 45 Survey conducted by IBSA (ibsa.brussels) in July 2016 concerning the newcomers who had arrived during the year preceding the reference date (2014 for 1 January 2015). The methodology used by IBSA differs with respect to that used by Ansay, which considered as newcomers ‘the people of foreign nationality who arrived recently and who are not living temporarily in Belgium without a permanent residence permit for more than three years’. 47 For the Dutch-speaking community, all of the figures presented in this section have been provided by Minister Liesbeth Homans following questions by Karl Vanlouwe [Vraag nr. 595, 24 March 2015; Vraag 598, 8 June 2016]. 48 The “Brusselnorm” constitutes a guide for the Flemish Community with respect to its policy in the bilingual region of Brussels-Capital and is based on the principle that the Flemish Community considers its target group in the territory of Brussels to be made up of 300 000 people. These 300 000 beneficiaries of its policies (30 % of the population of Brussels) represent approximately 5 % of the Flemish population (6 million people). 49 Dutch-language interpreting and translation service in a social environment for the Dutch-language and bilingual organisations in Brussels-Capital Region. This service is still a non-profit association/vzw but is financed by EVA. 51 Following the Sixth State Reform, COCOF now has a budget of 445.8 million for 2016, reduced by more than 92 million with respect to 2015, while COCOM has a budget of more than one billion euros. The transfer of new powers to COCOM is substantial, in particular regarding family allowance. In 2015, the budget assigned to COCOM was 1 180 529 000 euros and for 2016 is 1 293 641 000 euros. 57 In COCOF (French-language Parliament of Brussels), see: Proposition de décret créant un parcours d’intégration individuel à l’attention des primo-arrivants adultes déposée par Mme Françoise Schepmans et M. Serge de Patoul; Proposition de décret portant création d’un contrat bruxellois d’intégration et de participation déposée par Mme Françoise Schepmans, M. Philippe Pivin, M. Serge de Patoul et Mme Gisèle Mandaila. 58 See the comments on the articles of the reception programme decree, in particular section 6. Caractère obligatoire du parcours et collaboration entre les entités fédérées: “The proposed decree does not establish a compulsory character. It is, however, hoped that the reception stage will become compulsory for the newcomers concerned. (…) It is also hoped that when a newcomer’s linguistic skills are inadequate, linguistic training must be made compulsory”. 59 Political statement of the united college of the Joint Community Commission: “COCOM carried out the will of COCOF and VG to organise an integration programme in the territory of Brussels. The compulsory character of this programme was decided, according to the case, for the linguistic dimension or for the entire programme. Given the importance of this programme with respect to living together in harmony in Brussels, funds were allocated by COCOM in addition to the two communities, to ensure the effectiveness of the programmes” [2014: 11]. 60 A preliminary draft decree was approved at second reading by the united college of COCOM on 20 July 2016 and was sent to the Council of State. The third and last reading should take place at the beginning of October. 61 One may wonder if another possible approach could be the adoption of joint decrees, which is an alternative implemented by the Sixth State Reform: see art. 92bis/1 of the law of 8 August 1980 [Batselé e.a., 2014, No 656]; Avis du Conseil d’Etat no 52/303/AG du 20 novembre 2012. 62 Article 8 of the Constitution refers to the law to specify the ways in which Belgian nationality may be obtained and lost. In this case, this concerns the law of 28 June 1984 containing the Belgian Nationality Code, recently modified by the law of 4 December 2012,62 entry into force for the most part on 1 January 2013. 63 Loi du 4 décembre 2012 modifiant le Code de la nationalité belge afin de rendre l’acquisition de la nationalité belge neutre du point de vue de l’immigration, M.B., 14 December 2012. 64 Having taken ‘an integration course provided by the competent authority of a person’s main residence at the moment the integration course is begun’, art. 12bis, §1, 2°, d) of the Nationality Code. Four solutions are considered for proving social integration: diploma or certificate, professional training, an integration course or five years of employment. 65 As a reminder, two certificates are issued in the reception programme: one after the diagnostic phase (part 1) and another after the reception agreement (part 2) [see table 3]. Furthermore, the target public in the French-speaking community is limited: the reception programme is intended only for newcomers, as defined by the decree, but the other migrants (who do not fit this definition) may take citizenship courses via other channels in the framework of social cohesion. Will these courses be recognised? 67 Minister Vervoort – without specifying which certificate – wrote a letter in January 2016, encouraging the Public Prosecutor’s Office and the municipalities “to recognise the certificates which will be issued by BAPA as proof of the completion of an integration course” [Ganty & Delgrange, 2015: 526-527]. According to Ganty and Delgrange, ‘this letter has the virtue of providing useful information to stakeholders in the field even if, in our opinion, it is not legally binding’ (2015: 527, note 163). 68 See for example the statements by Rudi Vervoort: “For many years, the policy of Flanders goes well beyond the framework of newcomers. It also concerns social housing and is aimed at turning French speakers into Dutch speakers” [Report No 29, 26 February 2016: 6]; “This also highlights the differences with respect to the Flemish model. The Flemish approach is philosophically and culturally different from ours” [Report No 35, 17 June 2016: 17]. Catherine Xhardez is a PhD candidate in political science (F.R.S.-FNRS Research fellow) at Université Saint-Louis – Bruxelles and at Sciences Po Paris. Her thesis focuses on immigrant integration policies in multinational democracies with a strong nationalist component (Quebec, Flanders and Brussels). In 2015, she commented a decision of the Constitutional Court regarding integration and language as conditions for admission for social housing tenants in Flanders (Administration publique, 2015.